While the survivors in AMC’s hit series Walking Dead seem to be content to wander around in zombie-infested Georgia in short-sleeves and running shoes, up here in Canada we know that both cold weather and the risk of infected bites of the slavering undead hordes require somewhat heavier apparel: boots, jackets, parkas, and so forth. Not only does this prevent an accidental gnaw from turning into the dreaded Z-fever, but it keeps you warm and toasty when its -20C (with a -45C windchill). Quite a few of us have hockey gear stored away in the garage, which makes fine improvised body armour. Of course, we’re short of firearms, but there are hockey/lacrosse sticks and loyal huskies in partial compensation. Driving can be difficult when the roads haven’t been plowed since the apocalypse, unless you’re fortunate enough to have a snowmobile—but the cold also slows the zombies considerable, which have been known to freeze solid at a balmy -10C (and they certainly can’t ski). The final thing to remember about survival in the Great White North, of course, is that the other survivors are generally quite nice, polite, and equally poorly armed. They’ve even been known to share their meagre supplies of stale Timbits. 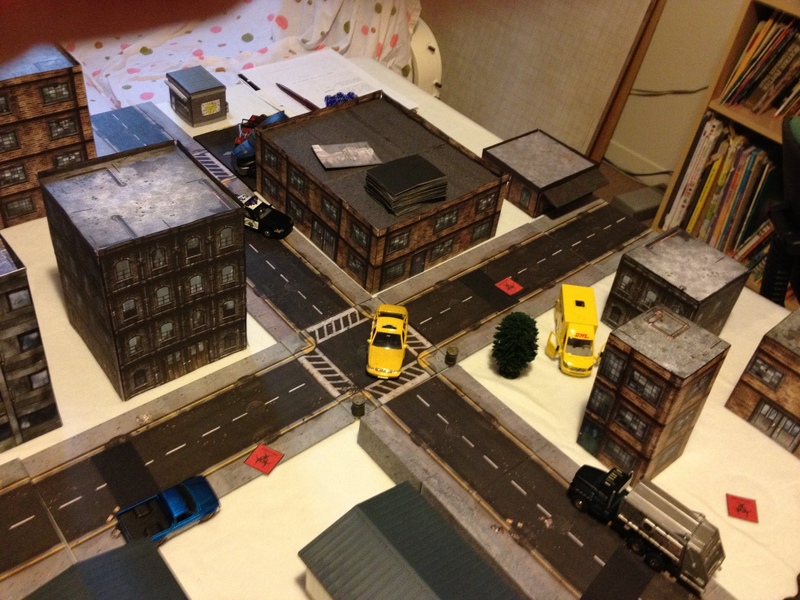 The game below reflected all of these special rules, as per the latest edition of the Ivory Goat Gaming Group’s ZoMbIeS rules. It was a couple of months ago, so some of the details are a bit sketchy. The small group of survivors had spent the summer holed up in an isolated cabin in the woods: Jacques LaTuque, a hockey coach from Trois Rivières; Cal, his star defenceman, originally from Alberta; Joe, an Inuit hunter from Kangiqsualujjuaq; and Rufus Tottingham, a very Anglo chartered accountant from Westmount in Montreal. Now that the first snows had begun to fall they decided to set off in search of Timbits for the long winter ahead. Regardless of what the miniatures might be depicted with, they had only one firearm—Joe’s hunting rifle—and very little ammunition. Jacques and Cal had hockey sticks, while Rufus was armed with little more than a letter-opener and a solid knowledge of now rather irrelevant Revenue Canada regulations. Despite the snow on the ground, they decided not to take the snowmobile—it could only seat two, and the noise would attract the undead. The buildings are all unsearched at this point. Again, when one gets close enough to check, they could turn out to be ransacked, intact, or even barricaded. The former are most likely to have zombies inside, while the latter are most likely to have supplies and/or other survivors. 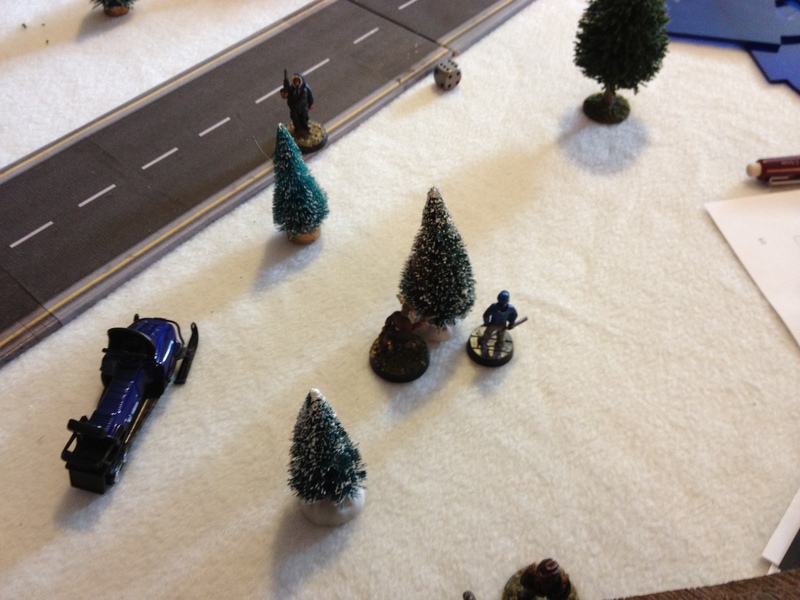 After a brief incident with a couple of walkers on the road, the survivors split into two to cover more ground. 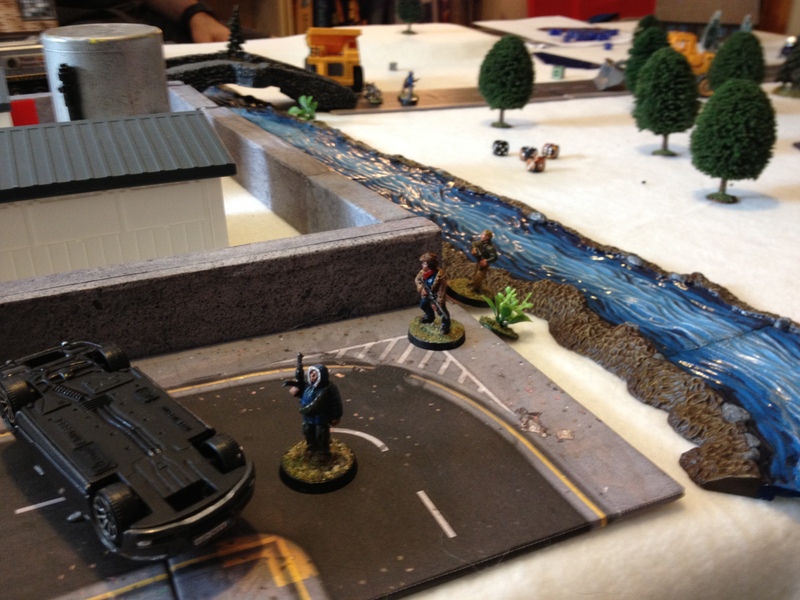 Joe, Cal, and Rufus crossed the frozen river (no one fell in), skirted a concrete wall, and investigated a wrecked car. Jacques found a small boy hiding on the outskirts of town (armed with an old revolver, no less), and then headed across the bridge into town with his loyal husky Poutine. If I remember correctly, Poutine fell defending them against a few more zombies at this point. Joe and his group soon ran into a group of walkers, and quickly retreated the way they had come. A few of the walkers pursued, but were finished off or fell through the ice. The group reassembled across the bridge, outside a barricaded apartment building. Shortly thereafter, another large herd of shufflers came around the corner. While Jacques, Joe, and the young boy fought them off, Cal and Rufus pried a few boards off the windows of the building and crawled in to hide—emerging only when it was clear that fiery coach and his hockey stick were getting the best of the melee. Needless to say, this caused a little dissension in the ranks, with Jacques uttering a string of Québecois expletives about the cowardice of les maudit anglais. Cal responded with an angry defence of the benefits of tar sands development and the evils of the environmental movement, causing everyone else to roll their eyes. Rufus seemed bizarrely upset about the lack of apostrophes on many of the outdoor commercial signs. Would questions of national unity tear the party apart? Joe shrugged and ignored them. He was increasingly of the view that these squabbling southerners were all just tourists who had overstayed their welcome. Fortunately, they found a frozen box of Timbits in the snow, and more supplies inside the apartment. They decided to all return to the cabin. Coach looked like he wanted to highstick Cal in a corner somewhere, but it didn’t come to that. Nice Worldworks table! 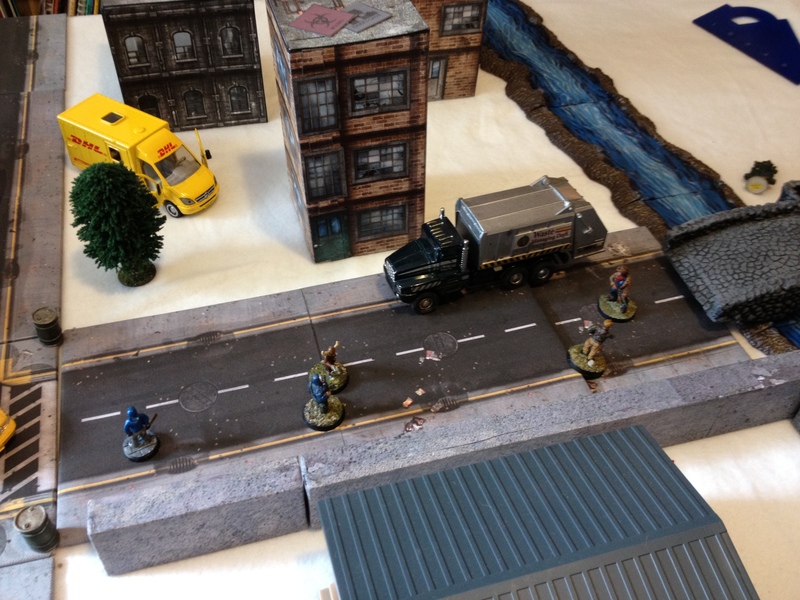 The trucks are particularly nice; I’ve been looking for larger trucks for my own Zombie table. Who makes the Garbage and Shipping trucks on your photos? 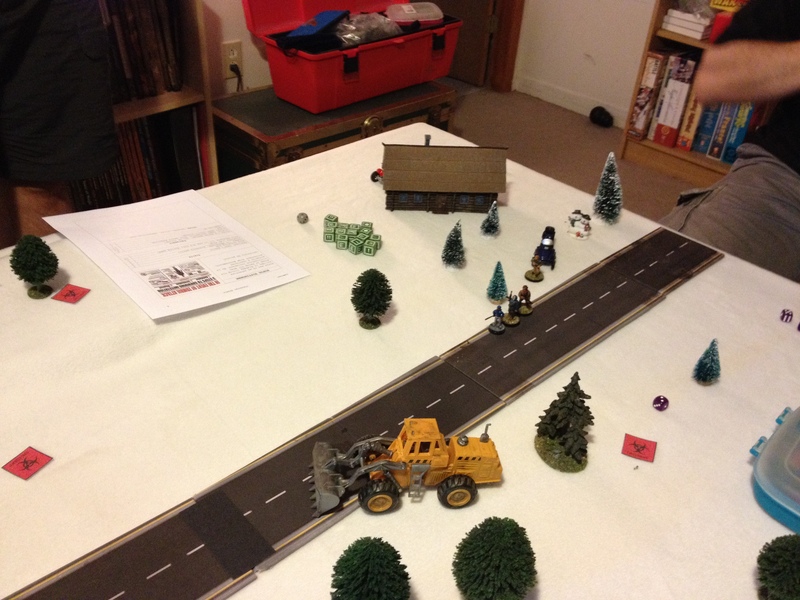 The shipping truck was borrowed, and the garbage truck was a no-name brand from a local hobby store for $6 or so.